Everyone has their favorite chocolate bar. I bet you already know where this is going. So what is yours? While there are many wonderful chocolate bars there is one that wins by a mile in my book. The loved Snickers bar. When I think about it, this fact probably doesn’t surprise most of my regular readers. You know that Snicker’s are made up of some of my favorite things so it makes complete sense that they would be my favorite. Oddly enough, though, I don’t have very many Snickers recipes on my blog. Did you see this cheesecake? While the candy bar is actually missing from the cookies, I promise that they actually taste like Snickers! Chocolate chips, peanuts and homemade caramel sauce add all of the tasty elements of the bar. I adapted these from this awesome chocolate chip cookie recipe and they turned out beautifully. I can’t wait to dunk them in my coffee in the morning! -what is your favorite chocolate/candy bar? -if you like them, what is your favorite way to eat candy corn? Preheat oven to 325 degrees. Melt the butter in a glass bowl and let it sit for 10 minutes to cool. In another large bowl, whisk the flour, baking soda and salt together and set aside. Add the sugars to the melted and cooled butter to the bowl of a stand mixer and using a paddle attachment, mix until well-blended. Add the eggs and vanilla and mix well. Add the flour in a couple of batches and mix until incorporated. Turn the mixer to the lowers speed and add the caramel sauce slowly, mixing until fully incorporated. Fold in the chocolate chips and peanuts. Scoop about 3 tablespoons of the batter and roll into a ball. Divide the ball in half and rotate each ball 90 degrees. What used to be the inside is no facing upward. Smash the two halves back together so that the jagged edges are facing up and place on a prepared cookie sheet, about 2 inches apart. Repeat with the other dough. *I have found that these cookies turn out the best when the flour, brown sugar and granulated sugar are measured in ounces using a food scale. Cookies look gorgeous! Snickers are not my favorite – I just don't like nuts in my chocolate! Strange, I know! My favorite candy bar is Milky Way – and I think if you left off the nuts, these might be very similar to those. Candy Corn, is there any way but by the handful?! Oh yes please!!! I love the homemade caramel on top!! Mmm I don't mind waking up to these at all! I have really lost my love for candy bars recently, but if I had to pick a favorite, it would be a war between twix and 100k bars. Oh Cassie, these are heavenly! Um yes please! these look amazing. My husband would just fall in love with these. If I had to pick a favorite it would be between milky way and twix! These look delish! When I was back in high school (a looooong time ago) everyday I would have a pepsi and a snickers after school. It was just my one thing I would do everyday. Snickers is by far my favorite but unfortunately I can't eat them like I did when I was young. Every now and then I will treat myself to one but now I will have to treat myself to these delicious cookies! Mmm sounds like my kind of cookie! Love these cookies! My favorite bar – almond joy. I eat my candy corn segregated. I like to eat one at a time, color by color (ok so I'm a bit weird, whatever). I'm not a candy corn girl, but these cookies have me teary. My favorite candy bars are Milky Ways and SNICKERS! So you know I love these cookies! lol And yes, I also love candy corn and I eat it one color at a time, usually starting from the white tip. This makes me want a Milkyway Midnight cookie! My favorite candy bar is snickers too! I tried making snickers cookies a few weeks ago and they were so ugly. The snickers nougat melted and created huge craters in the cookies, it was a mess. But they tasted delicious, of course! Is it wrong that all I keep thinking about is how amazing the dough would be? Mmmmm….I love Heath Bars of Almond Joy/Mounds. But I certainly wouldn't turn one of these cookies down…especially with the homemade caramel sauce! FABULOUS!!! I love Snickers too, it's always been my favorite candy bar. I know I'd love these cookies! Milky Way is my favorite candy bar and I like to eat candy corn by breaking off each color and eating it. I'm weird I know :). These cookies look and sound amazing! Ahhh I definitely want to put these in my face. They look delicious! I grew up in Japan but we surely had snickers and it was one of my favorite candy bars that my mom only let me try once in a while. I had a whole fantasy about this as a result. Your cookies are so tempting and look so good!!!! With a house full of boys I am constant need of cookies, I will be adding this to the list, yum! I don’t think I did. Will you try again? Thanks! oh wow, send some over pleaseee:) thank you for sharing this! 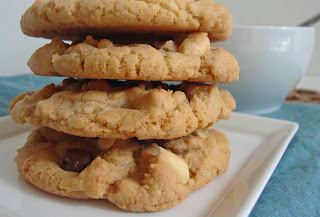 I love the gooey caramel and peanut chunks in your cookies. They look SO good! My favorite candy bar is nutrageous, but snickers is a close second. These cookies look yummy, soft, rich and just plain amazing!! Oh, and my favorite way to eat candy corn? By the handful! Oh, this is crazy good! I love Reeses peanut butter cups, but if it's a candy bar..I agree…Snickers by a mile! What an amazing job you did on this one! Reese's Cups are my favorite, but Snickers come in as a close second. These cookies look and sound amazing! I was hoping you would post a recipe after you teased us with the cookie picture on your caramel post! Lovely cookies! Snickers flavor is pretty awesome, got all the things I love so you’re a genius to put them in a yummy cookie 🙂 My favorite candy bar is a Cadbury Creme Egg. That counts, right? Buzzed! Snickers is my FAVE!! This looks totally delicious..
Cassie, these look great — and what a good idea! It is interesting to think about what your favorite candy bar is and then do something bakey-ish with it! My favorite candy bar is dark chocolate Reese Cup, followed by peanut butter Twix and dark chocolate Kit Kat. Not the conventional choices perhaps but my brain is spinning now on how to use them in a recipe! Um, can you please send a dozen of these this way?! 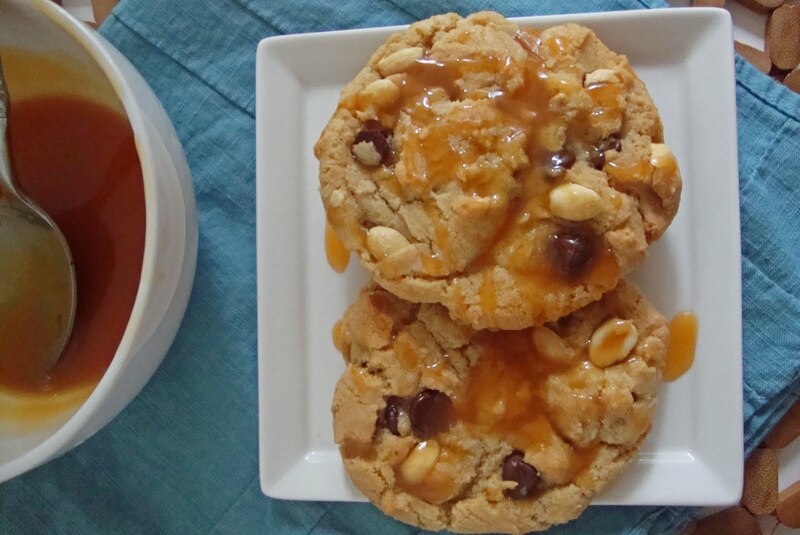 Snickers cookies with homemade caramel sound sinful! I definitely couldn’t say no to these!! These look amazing! I love Snickers bars so these will be right up my street. Great pics, too. Yummo Cassie! 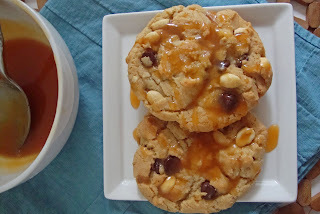 Love the caramel sauce on the cookies, just in case they weren’t yummy enough on there own!